Hello guys! I'm here to share with you how i got Free 500MB data with MTN Season Of Surprise. 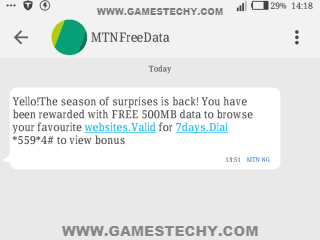 MTN Season of Surprise is back again and many subscribers are already getting their surprise. December is here again and MTN is already putting smile on the faces of her subscribers by giving out free 500mb data, free credit or free data + credit only. The Surprise package is different for all MTN subscribers. For instance, what i get for my own MTN surprise package will be different from what you will get as your own MTN surprise package. It all depends on your luck and the offer is not for all MTN subscribers. You just have to try your luck. Some users have already reported getting free 500MB data from MTN as their Season Of Surprise. The data is valid for 7 days. You can dial *559*4# to view your bonus data. To see your surprise, simply dial *142# on your MTN line. Once you dial that code, you will see your surprise package smiling at your screen. As for me, i got Free 500MB to browse for 7days. If you are lucky enough you might also get yours. Your surpise package can be the same or different from mine. Yours can be data + call credit, call credit only or data only. That's all. Don't forget to tell me what your surprise package is. Kindly use the comment box below.